Quite enjoyed the movie … Te animation is brilliant, the effects amazing. Overall, a nice movie to watch, and a movie I would recommend to anyone who would ask. This was a movie we were looking forward to for months. And the movie was worth the wait. There are a few thoughts I had about the movie, though. You know what? I women’s feel that cartoon characters, when brought into a somewhat human form, takes away part of the mystique around the character, which is a part of the persona of the character, which we give to it through our imagination. The were a few more things. One, the story wasn’t quite close to the original comic. There’s no sea voyage in the comic, and Tintin already knows Capt. Haddock, while in the movie they seem to meet for the first time on the Karaboudjan, which is a name you will find in another Tintin comic, though I can’t remember which one. Another thing which I thought was that to the best of my understanding, Capt. Haddock was English. He is descended from Sir Francis Haddock, and lives at Marlinspike Hall. In the movie, though, he was speaking with a continental accent, while one would have expected an English accent (though I am told by some that he was Scottish). All in all, an enjoyable movie, and would recommend it. Ok, time to get back to the comic. Having a discussion about movies got me thinking about how some movies stay with you, how some performances stay in your mind, in a way that you cant forget them, or you would go back time and again to watch them. And it is some such movies and performances that i am writing about here. I am not a big movies buff. Yes, i like the movies, the way they can tell a story, but i am not too adventurous with movies, or not the way i am with dining. Which means that i wouldnt go out to watch a movie only to try and see what its like. I would much rather wait for reviews, wait for the CD to come, and then watch the movie. This isnt applicable to children’s movies … i love them, especially when i am going with my son, but those i am not writing about, even though one is from the genre. So, what i am writing about is which movies i have seen the maximum number of times and the reason why i have seen those movies so many times. And, some of the memorable performances which remain in the mind. Angoor: This is an all-time favourite movie. The story is the familiar Comedy of Errors, but the performances by Sanjeev Kumar and Deven Verma are among those which one wouldnt be able to forget. The ease with which the comedy flows is superb, and makes for a movie which one can watch 54 times (that was the last count … i am planning to change that soon). Maine Pyaar Kiya: There … the fact that i have even seen the movie is a weel kept secret which has now come out. Yes, guys, i have seen the movie, and even though i wont tell you how many times, its in double figures (keep guessing!). But then, there was no choice. We were in IInd year in college, and the University (like so many others) was closed. Those were days of VCR’s, but the video cassette library in the neighbourhood was closed. And there was one video cassette at home … guess which movie? When not practising drums (had to let the neighbours sleep, remember? ), well … you know! Nice movie, actually, if you watch it once, or maybe twice, but a big hit of the times. Kung-Fu Panda: Po rocks. Wonderful movie, with a message which we would do well to realize … there is not secret ingredient. I have written about the movie earlier. I have watched the movie 17 times, and the only reason this isnt increasing over the last few months is that my son has decided, for a reason unfathomable to me, to share the CD with me. One of these days, i plan to convince (read brainwash) him that watching Kung-Fu Panda with Papa is the closest he can get to having a good time. OK OK, as you probably know, most parents will rot in hell for frauding our children on an almost daily basis. Agantuk: A timeless classic from the maestro himself. With a performance from another past-master of acting (Utpal Dutt) which you wouldnt forget in a hurry, the movie is worth every one of the 14 times that i have seen the movie. Though this again is something which i am planning to change soon. Anand: A wonderful movie by a director who excels in just about every movie he makes, mind-blowing performances by two super-stars (here i make the distinction between star and actor, one doesnt necessarily imply the other, and i feel the performances of both Amitabh Bachchan and Rajesh Khanna in the movie are superlative, ones which you would go back to see again and again, like i have, 11 times till now … again something i am planning to change soon, if i can find the CD), and music that haunts you every time you listen to it, Salil Chaudhari and Manna De giving some of the best music ever. Shubho Muhurat: A wonderful adaptation, with performances which are superlative. The narrative flows effortlessly, and the leading ladies, Sharmila Tagore, Rakhee, and Nandita Das have given nice performances. 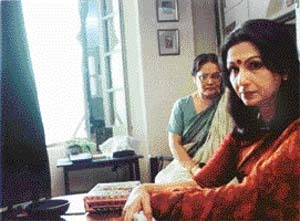 Nandita Das has done good work, and Sharmila Tagore has given a wonderful performance (really amazing, actually) and she looks definitely more charming now than during her heyday. But the piece de resistance of the movie has to be Rakhee. Her acting in the movie is simply superb. No other word for the movie. I have written about this earlier, and overall i feel the movie needs to be seen more than the 8 times i have seen it so far. Notting Hill:As romantic movies go, this is probably one of the best. A simple story, wonderful performances by everyone (really, though Hugh Grant and Julia Roberts do stand out, i think everyone has contributed to making the movie what it is), and this is a movie which i have seen 6 times, soon to change, i think. Mera Naam Joker: An amazing movie, wonderfully made, superb acting, amazing music, altogether a movie which i would like to see more than the 4 times i have seen it already. The movie moves you, touches you, makes you smile, makes you sad, overall, makes you flow with the emotions of the movie. Of course , Simi Garewal is gorgeous, too! Kaagaz ke Phool: I think Guru Dutt is one of the most under-rated directors ever. The movie has a story which i probably cant capture in a few words, so this is one of those movies which one must watch, probably more than the 4 times i have watched it, to actually understand the story completely, and to appreciate the music, the lyrics, and singing, some immortal names there … S. D. Burman, Kaifi Azmi, and Mohammad Rafi have given music which is very nice. I took some time getting roud to reading it, but now that i have read it, i found the book quite nice. At places its hilarious, at places brings out the struggle of the people trying to overcome stereotypes about others who are different from us, culturally, or in any other way. At the same time, the humour in the book comes from these stereotypes. Yes, the Tamilian in me is a little disappointed. But the Indian in me is quite happy. And more than anything, the human being in me is happy. After all, we’ve decided to use this opportunity to create more loved ones for ourselves. Ladies and gentlemen of Tamil Nadu, thnak you very much. Now we invite you to some Punjabi-style dancing with the DJ at the backside. With more than a little bit of alcohol lubricating the dance steps. A Wednesday … This is a movie which is quite a different take on terrorism … this is not only a different way of telling the story of terrorism, this is also one of the few films which also look at the issue of terrorism, and our reaction to terrorism, as a society, from a refreshingly comman-man kind of attitude. No, i am not going to spill the beans … rather you went and watched the movie … i watched the movie … on a Sunday … which was a day after the serial blasts in Delhi (at Karol Bagh, Connaught Place, and Greater Kailash). And, the blasts being fresh in the mind, the impact of the movie is altogether different. What was chillingly true … the way they have narrated the reaction of people to bomb blasts … we go through the news channels, see what each of the channles is saying, make a few phone calls, to make sure our friends and relatives are ok, and then, heave a sigh of relief and move on … and this pattern gets repeated every time there is a blast. There is another pattern … someone had informed someone else about the blasts before they actually happened, the blame-game begins (it doesnt matter who blames whome, in short, over a period of time, we have seen everyone blame everyone and their uncle (read Pakistan) for these blasts), compensation is announced, and we move on. Do we really care, as a nation, and as a society? Between Lunch at the new Italian restaurant in the neighbourhood, and watching a movie … something i just had to write about. 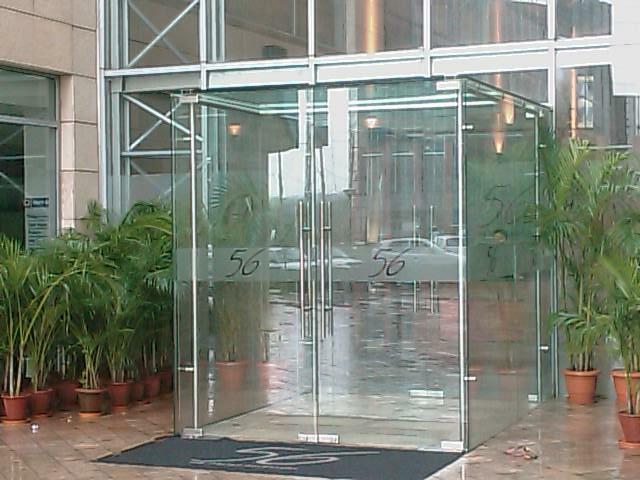 Lunch was at this new restaurant here in Gurgaon … this is named 56, but i am not sure where the name comes from. And i even forgot to ask them where the name (or maybe the number) came from. Well, the Mushroom Soup reminded me of the Chicken Stew which the wife used to feed the big fella (before he was old enough to protest, of course), the Pasta was nothing much to write home about, though the Seafood was quite delicious! The place seems like they decided to put a roof on the passage between two buildings, though the end result seems to be quite nice … but they sure charge you a bomb. Coming to the movie … as sequels go, The Mummy: Tomb of the Dragon Emperor doesnt come close to the originals … The Mummy, The Mummy Returns … Though the effects are awesome, i was still missing the original. The rule of the sequels again? Well, to cut a long story short, we are running a week behind schedule. A wedding in the family, and … So, we were late by a week for watching Kung-Fu Panda. Never mind … the movie is worth the wait. As always, i am not sure who enjoyed the movie more. You, yourself, are the source of limitless power … there is no secret ingredient to it! Food for Thought … its not Secret Ingredient Soup!